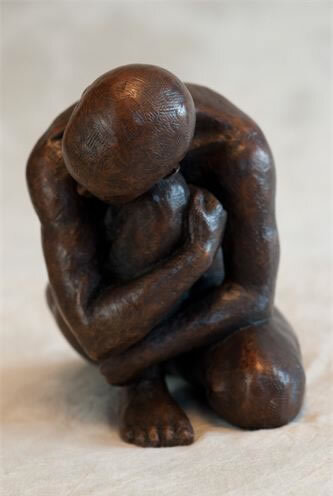 Moira is a figurative sculptor working largely from life. Her sculptures are created through close observation but are more to do with learning to see and interpret reality rather than just copying it, making each piece an individual creation, resulting in sculpture that is both intimate and anonymous. She continually strives to produce work which radiates a feeling of living energy, invoking a personal resonance with the viewer with a mixture of dynamic and restful poses. The subjects for her work include the female form, dancers and children at play and more recently a few animal sculptures. She models her original sculptures in either wax, clay or plasteline, from which they are then cast into bronze resin or foundry bronze. 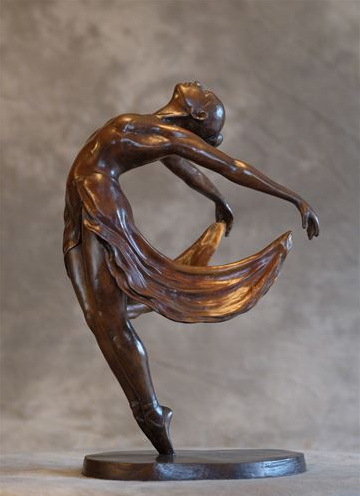 In 2011 Moira started selecting her first pieces to be cast in foundry bronze including “Argentine Tango”, “…and Sometimes I Just Sits”, “Self-contained Man”, “In a Safe Place” and “Power of the Dance”. 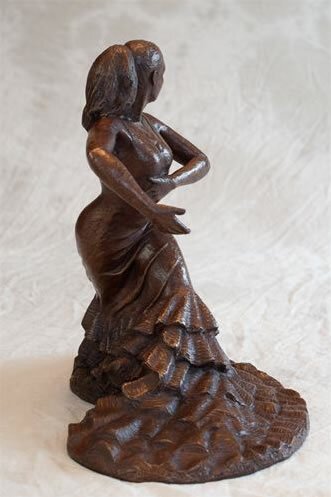 Her first flamenco sculpture (“Flamenco”) was inspired by photographs of a flamenco dancer on tour in the UK. Moira became fascinated with capturing the sense of movement in both the dancer and the fabric. 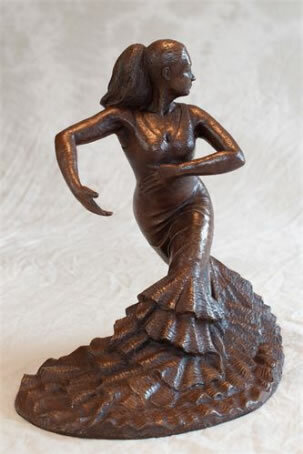 The sculpture “Flamenco Dancer” shows a very different use of the material of the skirts; a much softer flow of material, but combined with a strong upper body movement. The dance theme has continued with “Argentine Tango” a sculpture inspired by watching “Strictly Come Dancing”. Then in 2011 and 2012 Moira worked with Ester Tal of Mi Flamenco (www.mi-flamenco.com) to produce the “Power of the Dance”. 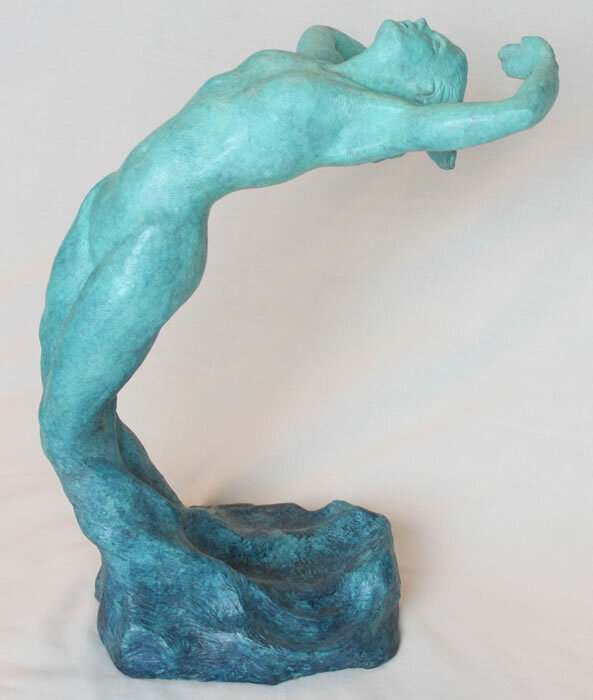 It was a great experience to be able to work more closely with a dancer and this comes through in the sculpture. Moira lives in Purbeck, Dorset, a really unique and beautiful part of the country and, being at the seaside, the summer months are full of inspiration for sculptures such as “Building Sandcastles”, “Treasure” and “On the Beach”. The crouching position for the little boy and the sandcastle is one that is very characteristic of a young child thoroughly engrossed in what he is doing. As for many sculptors there is always the fascination of the pure human form, without any flamenco dresses or sandcastles. 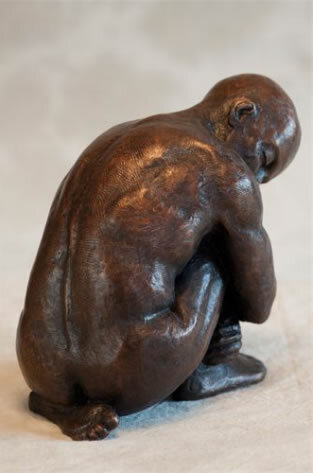 The rounded curves of the human form are engaging in their own right and will always be a large part of Moira’s work. 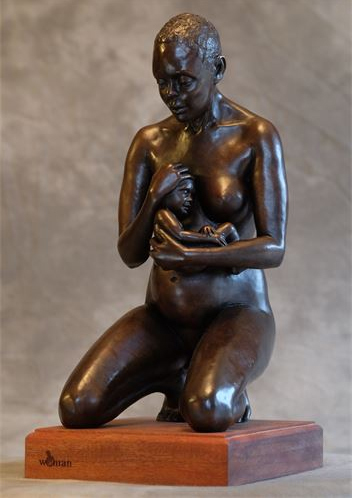 In 2012, for the fourth consecutive year, Moira has sculptures accepted as part of the Society of Women Artists annual exhibition in the Mall Galleries in London. Moira was thrilled in May 2011 to be elected as an Associate Member of The Society of Women Artists (ASWA). She also received an award for her sculpture “Male Torso” which was presented by Princess Michael of Kent at the Private View of the 2010 exhibition.